The wiry stems have small, grey-green aromatic leaves. 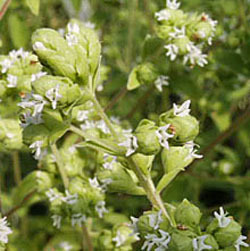 The spikes of tiny whitish flowers are in loose clusters. This is an essential culinary herb. Keep the flowers cut back to encourage new growth for cooking.